I love summer eating. I write about this every year, the turning point when garden produce goes from fun meal accessory to mainstay-- and what a good point it is. Second or third week of June, usually, when the spinach and lettuce are joined forcefully by peas and broccoli. This summer and fall, I want to do one post per month that's just a week's worth of meals from the garden. It'll be a way of celebrating the abundance, and also a way of documenting how we're eating now. So much fun, I imagine, to look back on in ten years. 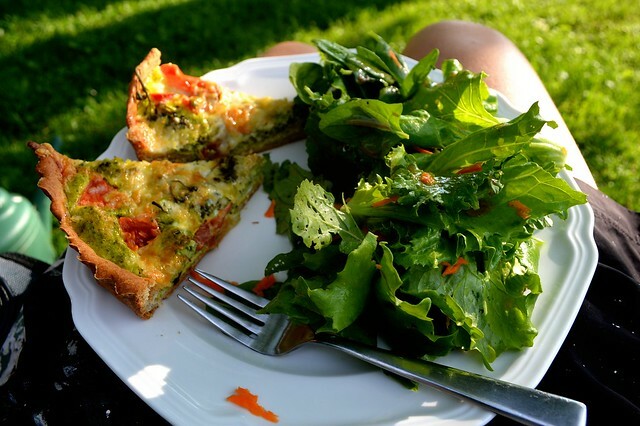 Above, we have a vegetable tart with garden broccoli and arugula pesto, and of course salad from the garden. This tart is one of our favorite go-tos: a light whole wheat crust-- not a buttery pastry crust-- filled with our eggs and whatever vegetables we have on-hand. It's such a nice break from the easy stir fry/soup/pasta rut we get into from time to time. 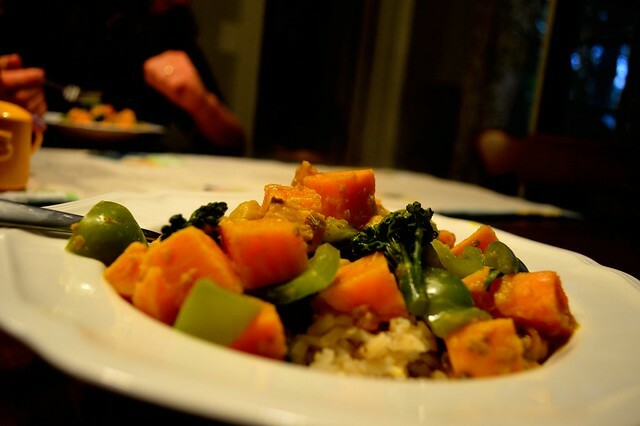 This was a sweet potato and broccoli curry with coconut milk. I made curry paste from an onion, some frozen garden jalapenos, and a bunch of cilantro and basil from the garden. I just started making curry paste regularly, actually-- in the food processor, I can make enough to use fresh and freeze for several more dinners. And it's worlds better than what comes in that little $5 Thai Kitchen jar. Sesame baked tofu with peas. I swear I've made this every June for the past five years. 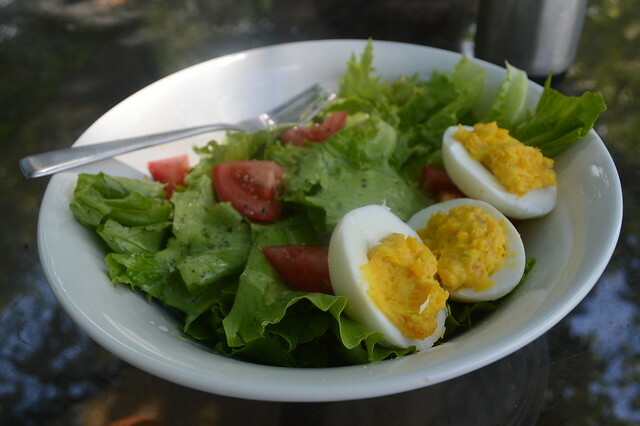 Giant salad with deviled eggs. This was yesterday's lunch. The tomatoes are not from my garden, but they are local. And I made green goddess dressing (basically a really amped-up ranch with basil and spinach included) to drizzle over top. Which brings us to.... more peas. Good thing they're so delicious. 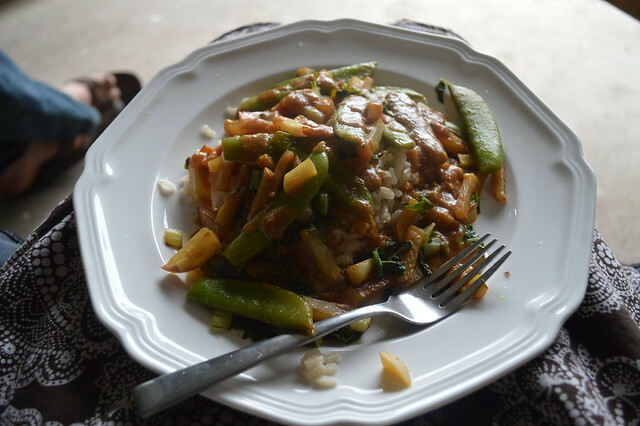 This was just a simple stir fry with turnips, peas, bok choy, and a peanut butter sauce. There were a lot of Asian flavors in our meals this week-- I guess inspired by the peas. 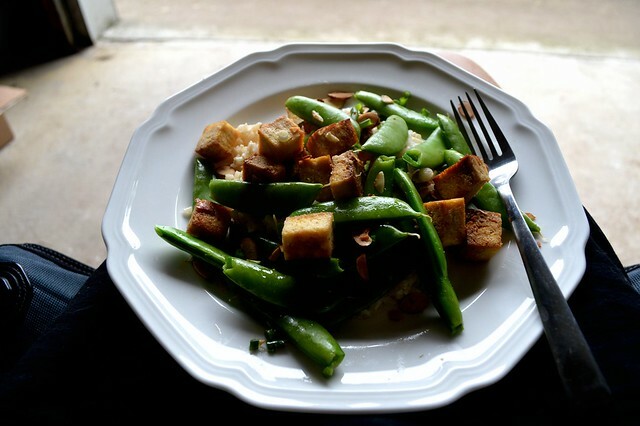 The snap peas I love to grow just go best in stir fries, with sesame oil and soy sauce and those sorts of flavors, though this week I'm planning to use some in a pasta carbonara. For all these peas we've been eating, I've still managed to give some away and freeze nearly two gallons' worth. Amazing, how fast they come on and how fast they go. For now I'm just making the most of pea time, and broccoli time, and speculating how long it will be before we have zucchini to eat, too. Yummy!! Care to share your Green Goddess recipe, please? I just threw things in a blender this time, but basically-- equal parts yogurt, mayo, and packed fresh basil & spinach, juice of half a lemon, ground pepper. I think that's all I put in-- so good!